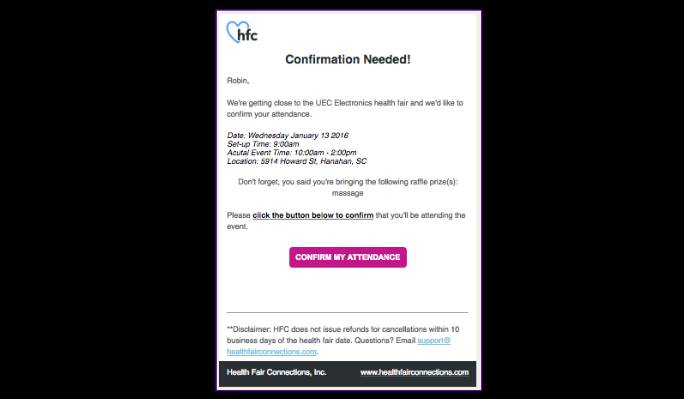 HFC will email all registered vendors at least 3 times asking them to click a button to confirm their attendance in the health fair. If a vendor has yet to confirm their attendance, vendors will then be sent a text message asking them to confirm their attendance. HFC also warns vendors they’ll receive a $50 no show fee if they don’t cancel within 15 days (we've added 5 days from what you see above and we no longer charge for booth fees). HFC has a credit system for vendors that allows them to accrue monetary credits if they did do a premium ad (much different than a booth fee). If the vendor has any credits, our system will deduct $50 worth and if the vendor doesn’t, it will put them in a negative credit balance.